Williams performs onstage in November 2012 during the 6th Annual Stand Up For Heroes at the Beacon Theatre in New York City. 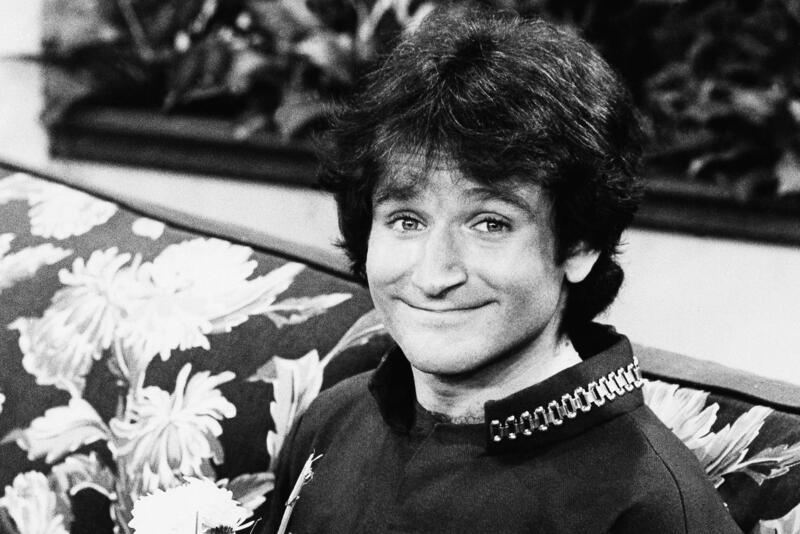 Williams on the set of ABC's Mork and Mindy in 1978. His character, Mork, first appeared on the show Happy Days before being spun off into its own show. 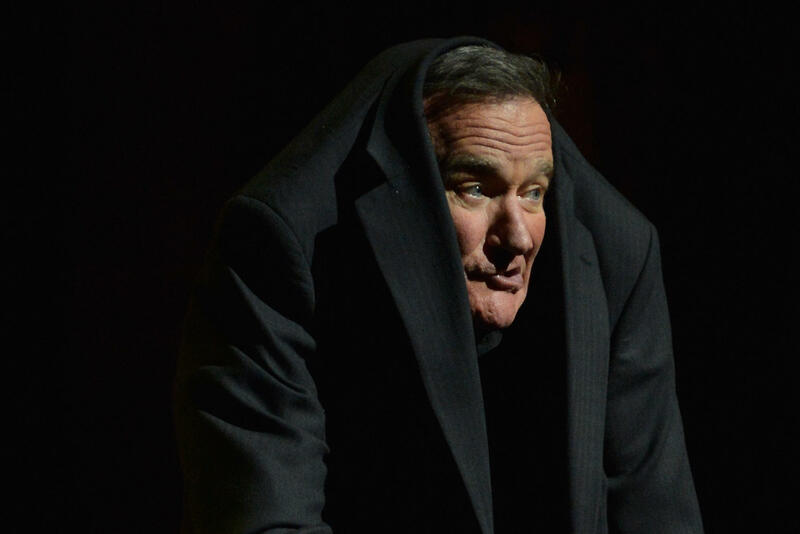 Comedian Robin Williams makes a face as he rises out of his chair during a November 1993 interview in New York. In the 1995 film Jumanji, Williams was a man who had been trapped for decades in a magical board game. The film topped $100 million at the box office. 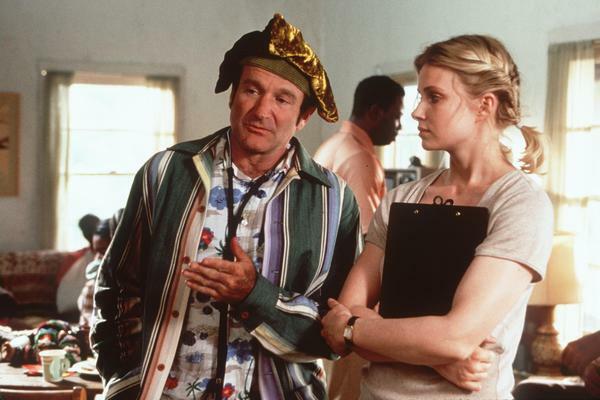 Williams and co-star Monica Potter in the 1999 movie Patch Adams. Although the film was commercially successful, it was one of a number of critics' flops Williams headlined in the late '90s and early 2000s. 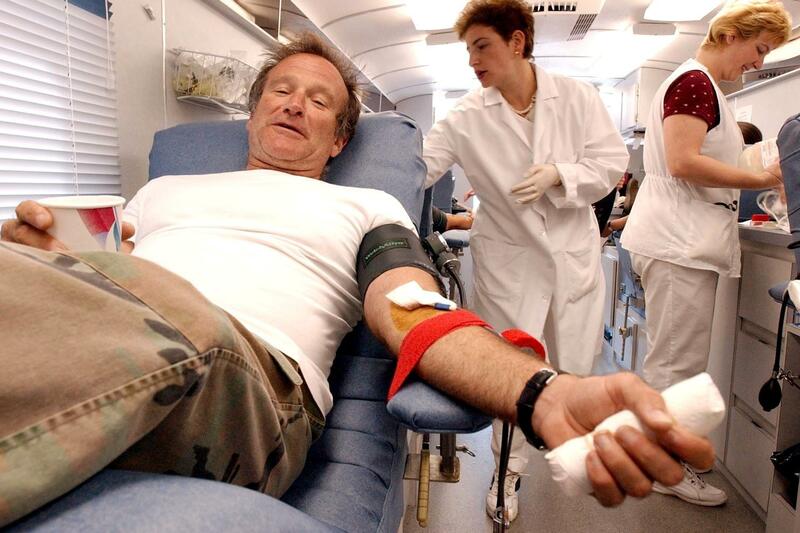 Williams donates blood on Sept. 11, 2001, at the Irwin Memorial Blood Center in San Francisco. Oscar-winning actor Robin Williams was found dead in his California home Monday. He was 63. His death is under investigation, according to a press release from the Marin County Sheriff's Office. Emergency personnel arrived at Williams' home in Tiburon, Calif., at noon Monday. The sheriff's office suspects the death to be a suicide due to asphyxia, the release said, "but a comprehensive investigation must be completed before a final determination is made." Williams' publicist, Mara Buxbaum, said Williams had been "battling severe depression of late," according to the Los Angeles Times. "This is a tragic and sudden loss. The family respectfully asks for their privacy as they grieve during this very difficult time." 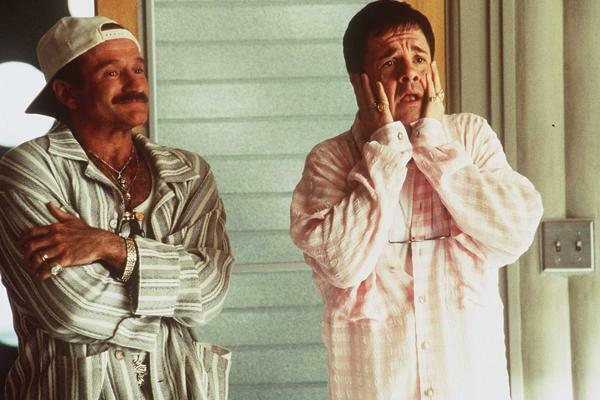 "Williams began his career as a standup comedian and voice-over actor. He shot to fame in 1978 as a twinkly-eyed alien opposite Pam Dawber in the hit TV comedy Mork & Mindy. 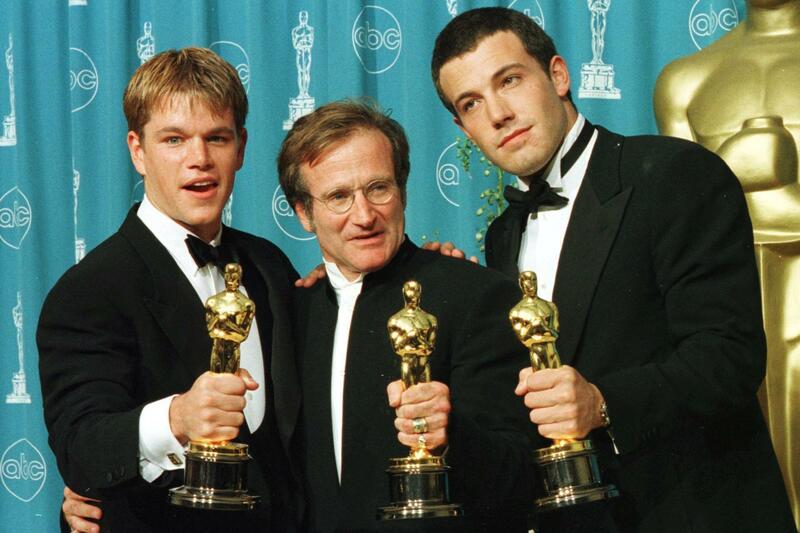 Williams would go on to receive an Oscar for his work in Good Will Hunting. 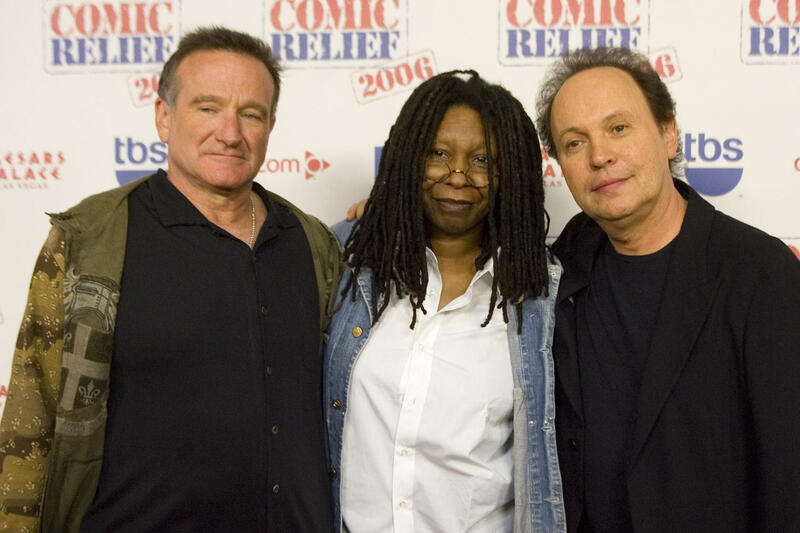 And he would establish the annual fundraiser Comic Relief with fellow comedians Billy Crystal and Whoopi Goldberg." 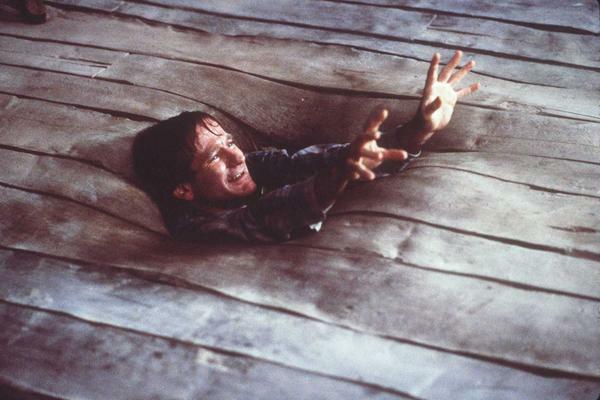 Williams had a couple films in the works at the time of his death, Entertainment Weekly reports. The third installment of Night at the Museum is due out in December and he had signed on to do a sequel of Mrs. Doubtfire. 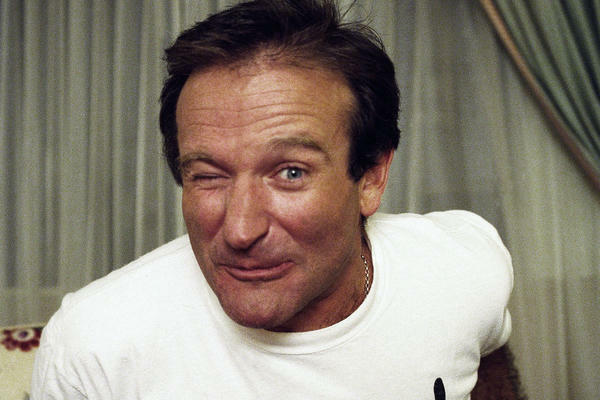 For a peek back in time, take a look at this New York Times review of Williams' standup in 1979, which starts with, "It's extraordinary that anyone as funny as Robin Williams can also create the impression of being so nice." -- On Fresh Air in 2006, after the release of the film The Night Listener. -- Bob Mondello's 2006 review of the movie Man of the Year. -- Jeff Lunden's 2011 story about the Broadway play Bengal Tiger at the Baghdad Zoo. -- Tomas Hachard's review of The Angriest Man in Brooklyn this past May.